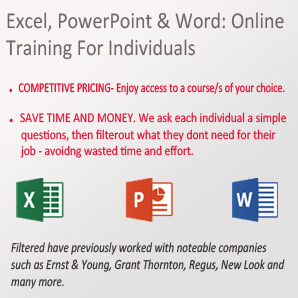 Green Turn and Filtered have partnered to provide online Microsoft Office training to individuals looking to pursue a career at one of the big four firms: PWC, Deloitte, KPMG and Ernst & Young. Courses consisting of popular Microsoft Office tools; Excel, PowerPoint and Word – which are essential skills to posses for applicants. 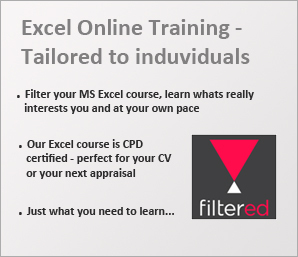 Filtered courses take into consideration the users current skills and customises the course specifically to what the user needs to learn – consequently saving you time and increasing your efficiency. 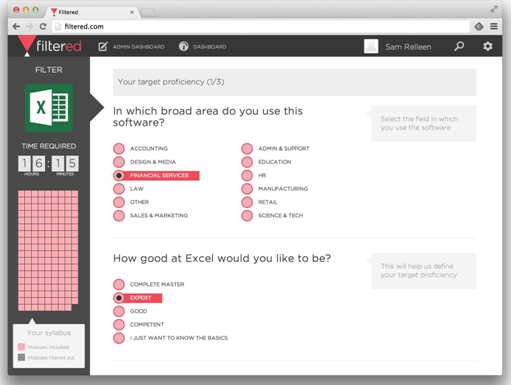 We ask users a simple set of questions which enable us to filter out anything users don’t need, or already know. What remains is an achievable, precise learning objective that makes best use of the customer’s time and learning experience. Our courses adapt according to the initial existing knowledge of the user, and we collect, analyse and present the data so that you can track and measure your progress. What Filtered can do for you? 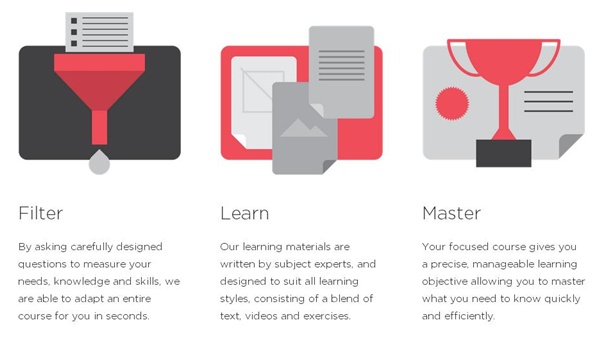 To allow you to save time and optimise your working day we recognise the importance of teaching you just what you need to know. 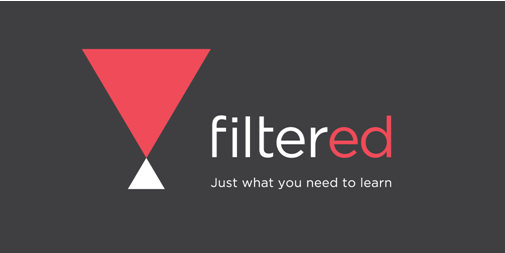 Our Filter has its own unique dashboard that allows you to flick through the syllabus accordingly, letting you manage exactly what you need to learn and when you feel it is essential. 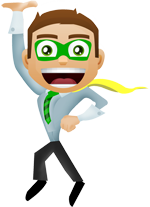 Foundation: Excel terminology and enough functionality just to get going. Orientation & efficiency: teaches the basics of Excel and techniques for interacting with it efficiently. Administration: covers the practicalities of working with Excel files, changing default settings, protecting files and working collaboratively. 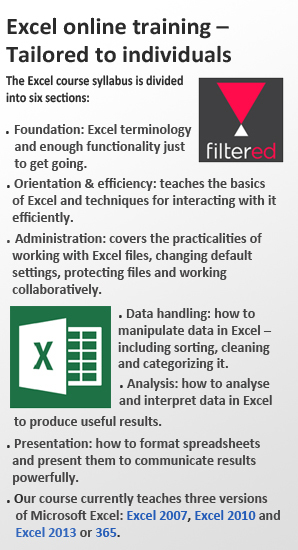 Data handling: how to manipulate data in Excel – including sorting, cleaning and categorising it. Analysis: how to analyse and interpret data in Excel to produce useful results. Presentation: how to format spreadsheets and present them to communicate results powerfully. Our course currently teaches three versions of Microsoft Excel: Excel 2010, Excel 2013 and Excel 2016 or 365. Our PowerPoint course is divided into five sections. Foundation: PowerPoint terminology and enough functionality just to get going. Basic slide editing: teaches basic techniques to add diagrams and text to slides effectively. Administration and efficiency: how to produce presentations collaboratively, tailor PowerPoint settings and printing to optimize your interaction. Communicating analysis: how to present data and analysis accurately and powerfully. Making an impact: incorporating images and animation and present your slides so their message hits home. Our training currently includes two courses teaching three versions of Microsoft PowerPoint: PowerPoint 2010 and 2013 (that's one course) and PowerPoint 2016 or 365 (the other course). Our Word course is divided into 5 sections, each containing a number of units, and each unit in turn being split into a series of modules. Basics: here we cover a range of formatting features and techniques that apply to individual characters and up to entire documents. We also look at a range of automation techniques to make Word do more of the work for you. Common Tasks: having covered basic document production we move on to some more specific Word tasks including the creation of lists and tables, producing multiple letters, envelopes and labels using mail merge, and some useful techniques for creating documents that use graphics such as a newsletter. Administration: this section looks behind the scenes at Words options and how to manage Word document files, while taking a look at how to manage a Word document in a team of users. Taking Word further: some Word users may never need to work with forms or more complicated documents that include complex numbering schemes or multiple sections for example but, if you need to use Word to produce substantial reports or essays or even a university thesis then the contents of this section might save you hours or even days. Our course currently covers Word 2013 and 2016.